Jakarta Tourism and Culture Dept. 's Maritime Museum Management conserves VOC water reservoir in Onrust Island, Untung Jawa Island Sub-district, South Seribu Islands.
" 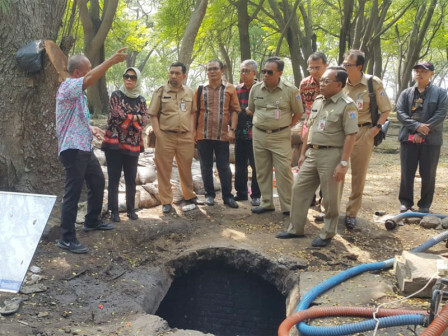 In this conservation, we are doing maintenance and clean VOC water reservoir's well which is located in the middle of Onrust Island"
Jakarta Maritime Museum Management Acting Head (Plt), Sri Kusumawati said, VOC water reservoir was built in 17th century and located underground. There are 8 rooms which are connected to each others with capacity around 50 thousand liters. This water reservoir needs to be drained and maintained because it is covered by soil and mud. "In this conservation, we are doing maintenance and clean VOC water reservoir's well which is located in the middle of Onrust Island," she stated, Wednesday (12/12). She informed, conservation has been started on November 13 with budget Rp 92,383,950.